The winding Gorges du Verdon stretches through the Parc Naturel Regional du Verdon in Provence, France in Europe. The Gorges du Verdon is one of the wonders of France and forms a natural border between the Var and the Alpes-de-Haute of Provence. It is also known as the Grand Canyon of Verdon, because, although much smaller than the American Grand Canyon, it is the largest one in Europe. The Verdon river rushes through the 21 kilometer length of the gorge, at times through extremely narrow steep cliffs (up to 700 meters deep) until it flows into Lac Ste Croix at the western end of the Gorges du Verdon. 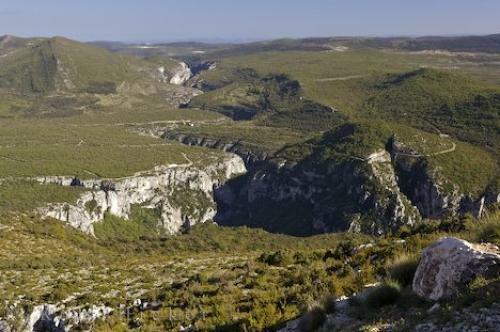 The Gorge is part of the Parc Naturel Regional du Verdon which was established in 1997 and covers 180,000 hectares. Photo of the long gorge that makes up the Gorges du Verdon in the Parc Naturel Regional du Verdon in Provence, France. Pictures from photo gallery "France Pictures"
This picture is part of the photo album "France Pictures" - there are more beautiful images waiting for you. ... In Martel's book 'La France Ignoree', written in 1928, one can read a interesting report of the first 'through-trip' of the Gorges du Verdon. Between La Maline and Point Sublime part of the Martel Trail is still in use. If one wants to travel the full loop around the Gorges du Verdon in Provence, France, it is over 100 kilometers so allow the whole day for the trip, but it will be well worth it to enjoy the wonderful splendor of the European Grand Canyon. Grand Canyon du Verdon, Gorges du Verdon and the Verdon River, Parc Naturel Regional du Verdon, Alpes de Haute, Provence, France, Europe. I photographed this photo with the digital SLR camera model Canon EOS-1Ds Mark II, aperture of f/7.1, exposure time of 1/100 sec. on ISO 100, as always I used a original Canon Lens, the focus lenght for this picture was 42mm.